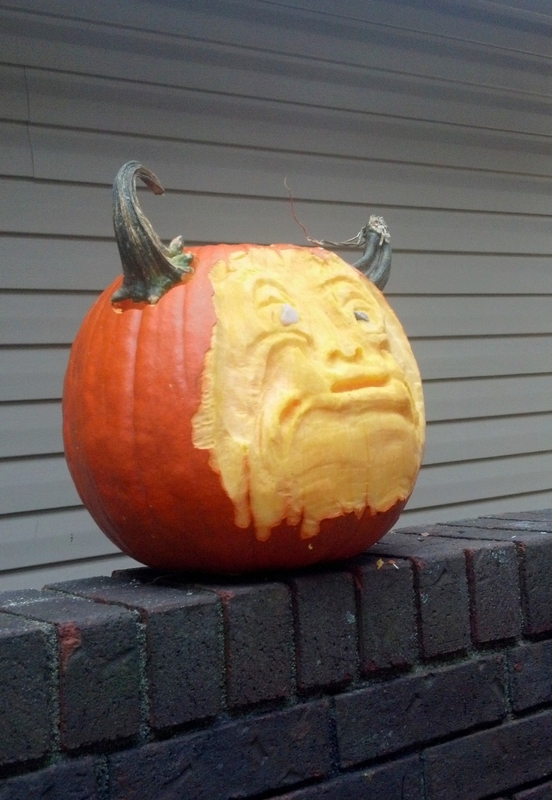 This week got a late start, though we did get to carve out a fun Ogre. Foster Kid and I ran into a couple issues with the pumpkin, but we still had a good time. Happy Ogre with a healthy number of horns. Sad Ogre with stolen horn. First, the walls were surprisingly thin, which made our plan to use the deformed shape of the pumpkin much harder to implement. Secondly, our clever, clever plan to use pumpkin stems as the Ogre's horns was stymied when squirrels ran off with the fresher of the two stems. Foster Kid helped scrape everything down and suggested the stones in the eyes. He picked out and placed the stones in the eye. One quartz and one "just a plain rock". The Orange Ogre looks a bit better in person than the photos show. The horns really were a good idea. Too bad Rocket J. Squirrel made off with one. Next pumpkin I think we'll go a little simpler so that we can wrap one up and feel like we really finished one off well.